Daily Cheapskate: 20-piece Lenox Butterfly Meadow China (service for 6 plus 2 bonus mugs) for $99.99 shipped. Under $17 per Lenox place setting. 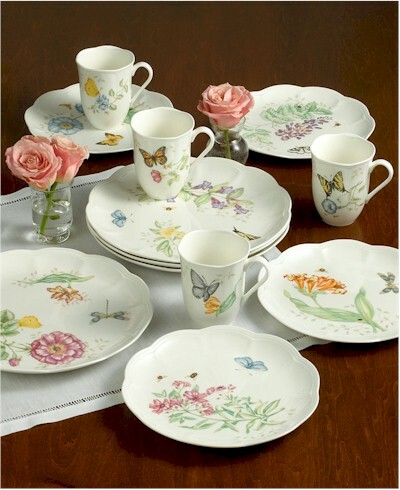 20-piece Lenox Butterfly Meadow China (service for 6 plus 2 bonus mugs) for $99.99 shipped. Under $17 per Lenox place setting. Today, 10/27/16 only, Macy's has got this 18- plus 2- piece Lenox "Butterfly Meadow" china (service for 6) for $99.99 with free shipping. That comes to a little under $17 per place setting. Made of fine porcelain china for all-occasion use. Mix-and-match butterfly and floral motif; scalloped edges. Designed to go from freezer to oven to table, microwave- and dishwasher-safe. Coordinates with Butterfly Meadow serveware, crystal, and flatware. If you never imagined that you'd be able to afford a Lenox china set, now's your opportunity to grab this one at a superb price.